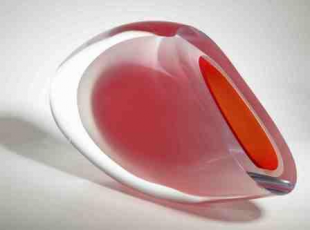 From Fran Staniland’s second series of work – the Gem series. Fran’s first series – the Ice series – was inspired by the ice fields of Canada. The Gem series expands Fran’s use of colour to incorporate jewel-like colours while retaining her theme of encapsulating colour in layers of opaque and clear glass. The result – simply stunning.